Text: In the evening we went to a cinema to see the film “Three Comrades”. The seating accommodation was hard, but not really uncomfortable. 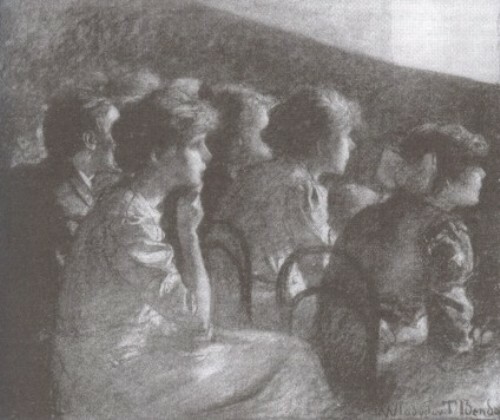 The audience were patient and enjoyed themselves. The film concerned the machinations of certain directors of factories who tried to steal material from one another’s works, in order to fulfil the Plan, and the exposure of a Communist Party secretary who favoured them because of personal gifts. The heroine was a member of the Party whose capacity for invective must have been immense, judging by her volubility and facial expressions. The secretary got his deserts, the directors were discredited, and all ended unhappily. The film broke twice and took some five minutes to patch up, during which the audience stamped and clapped their hands in a manner reminiscent of the early days of the British films. Comments: Walter Citrine (1887-1983) was a British trade unionist. He was a General Secretary of the Trades Union Congress and president of the International Federation of Trade Unions. He visited the Soviet Union on a number of occasions. This account comes from a diary entry for 11 October 1935 in the city of Kislovodsk. The film he saw was Tri Tovarishcha (USSR 1935), directed by Semyon Timoshenko. This entry was posted in 1930s, Diaries, USSR and tagged Audiences, Breakdowns, Kislovodsk, Seating, Tri Tovarishcha (1935), Walter Citrine. Bookmark the permalink.